Christmas winter wonderland. | Cross Stitching Heaven. This is my Christmas winter wonderland project. 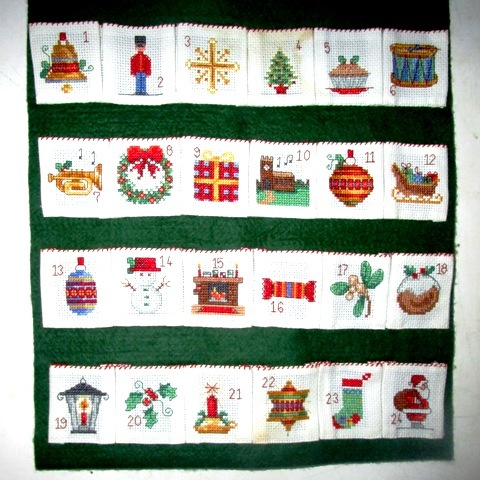 A beautiful cross stitch Christmas advent calendar that I completed for my children, so they weren’t eating chocolate every morning. I filled it with small sweets and small advent gifts each day making the build-up to Xmas just a little bit more exciting. Purchased from Avon Cosmetics a long time ago and I believe no longer available the kit contained everything I needed, including the Anchor threads, to finish the craft project (well……I had to find the stick and ribbon to hang it with!) 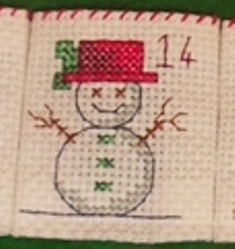 This complete kit was simple to stitch and easy to put together. The pattern was clear and easy to follow and all the threads were of a good quality. Each individual picture is wonderfully detailed with traditional Christmas symbols – holly with red berries, figgy pudding, a snowman, a church, lantern, a candle, Santa and a gift to name but a few. I really enjoyed this cross stitch project and it has now become a family tradition to hang it every Christmas. 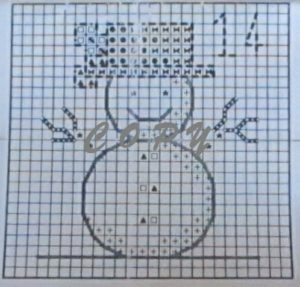 Some of the simpler individual pictures are suitable for children to stitch if you have any spare Aida. I have used the Christmas tree design for sewing my own Christmas cards! 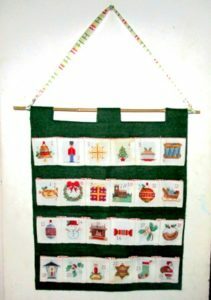 If you would like to make a Christmas advent calendar there are a few kits available Here.